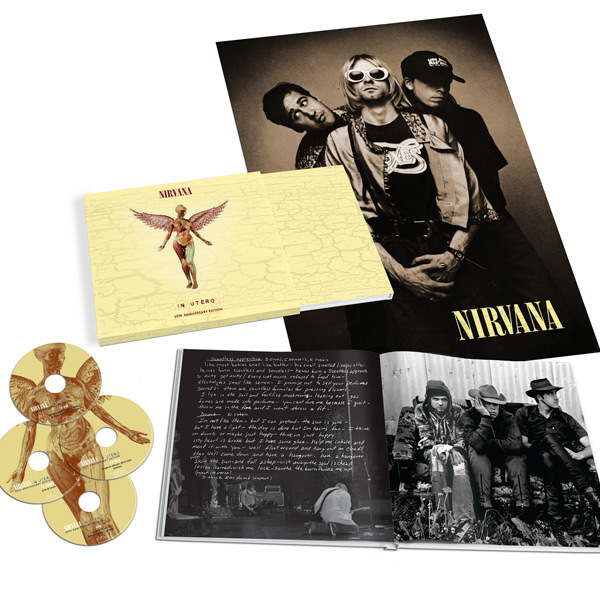 This In Utero 20th Anniversary 3 CDs + DVD Super Deluxe Edition of the unwitting swansong of the single most influential band of the 1990s features more than 70 recordings, including B-sides, compilation tracks, never-before-heard demos and live material featuring the final touring lineup of Cobain, Novoselic, Grohl, and Pat Smear. The album producer Steve Albini revisited the original multi-tracks and created a new stereo mix of the original album tracks. This box set also includes a CD and DVD of the complete and newly edited MTV Live and Loud show from Seattle’s Pier 48 on December 13, 1993 with a 5.1 surround sound and stereo soundtrack. DVD extras include never-before-released rehearsals for Live and Loud, the original music video and director’s cut video for “Heart-Shaped Box” and seven European TV performances. A comprehensive 60-page bound book showcasing never-before-seen photos, documents and various other artifacts of the In Utero era, as well as a double-sided 17″ x 24″ poster round out the anniversary collection.